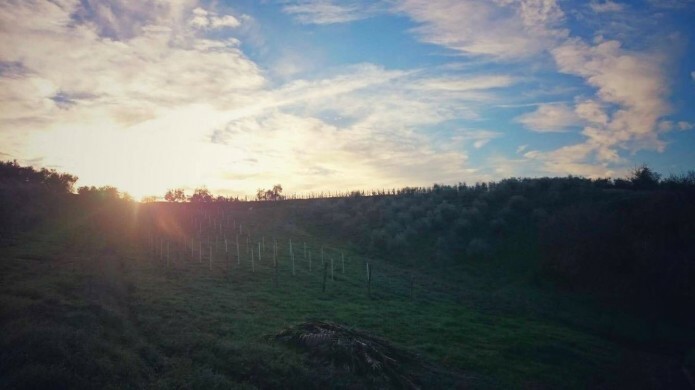 The Tuscan Green Gold, from the farm to the fork! Autumn isn’t only about roasting chestnuts and sipping red wine by the fireplace. There’s pretty little time to just sit around, when living in the Tuscan countryside. So between the golden autumn leaves and the first winter chill, as soon as we’re done with the vine harvest, we must get our strength back and be ready for a new adventure: the olive harvest. 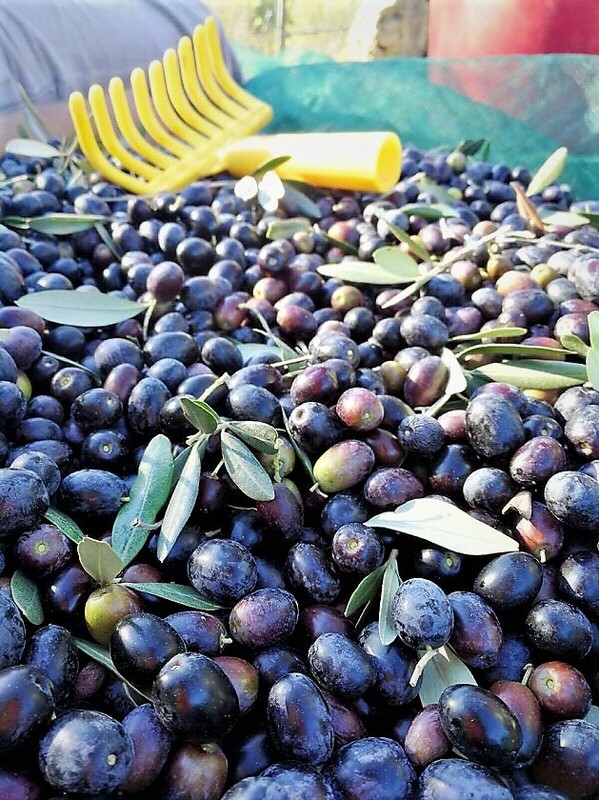 Pretty much like every other year, we start picking olives in our farm, around the mid of October, and just before the first chills of November. Anciently it was used to wait for the olives to be fully mature before harvesting. 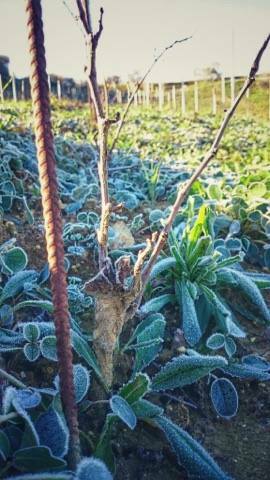 But the weather wasn’t always merciful with crops in late autumn, so to protect them from the early frosts, over the years people have traditionally developed the custom that we all know today, to harvest olives earlier: before they are fully ripe. 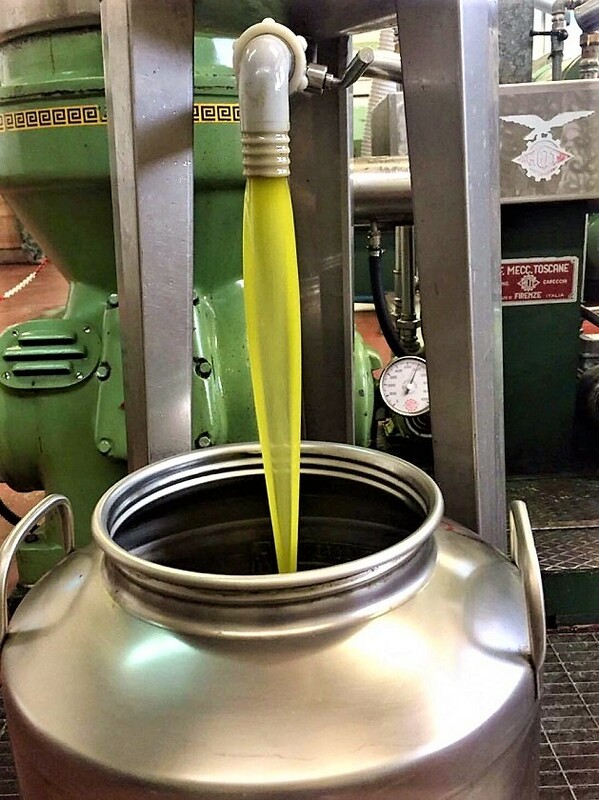 This tradition, has become an essential part of our territory’s reputation worldwide, for it has given us a unique product of excellence: “l’olio novo” toscano (the freshly pressed Tuscan extravirgin olive oil). 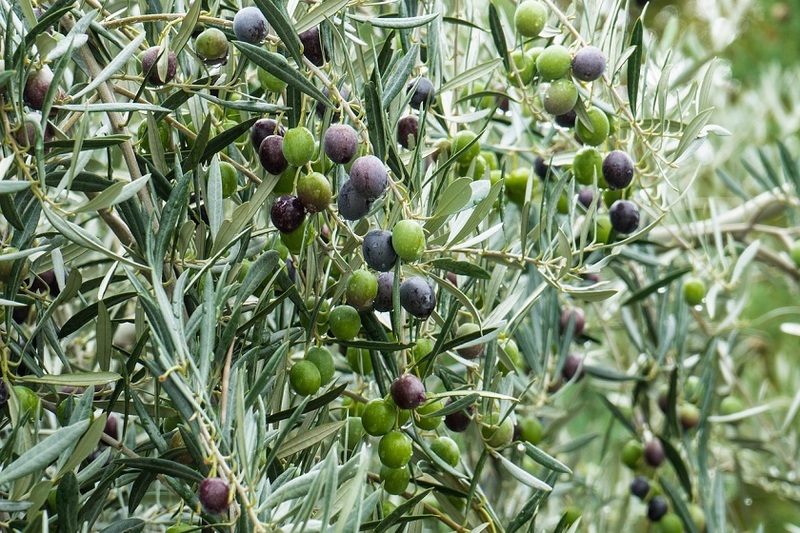 Unique because the chemical and organoleptic characteristics of the PDO extravirgin olive oil are mostly related to the climate of the growth area, which influences directly the quality of the phenols, the bitterness and sharpness of the taste. So harvesting olives before they are ripe, means the level of polyphenol they contain is still high. And although, unfortunately for us, that implies a lower quantity of product, it’s actually just what it needs to obtain the perfect contrast of that intense bitter and peppery taste, so typical of the Tuscan extravirgin olive oil. However, the final result for each batch of oil, also depends on many other elements, so much that it’s almost impossible to have two different productions with the same taste, even within the same area. 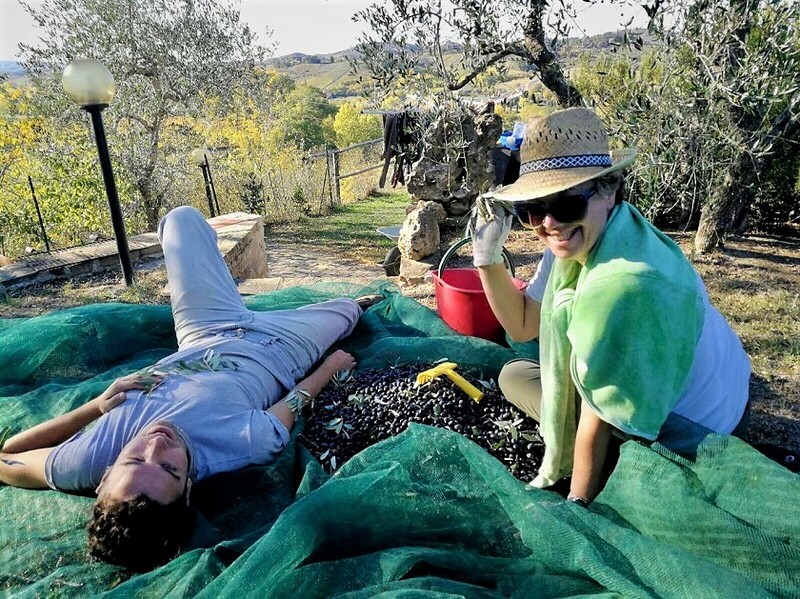 As we always do in our farm, harvesting olives turns into a family fun activity. Being a farmer is a rather tough physical effort and any extra hand is always welcome; so traditionally during the olive harvest, close relatives and friends or neighbors from the nearby farms gather to offer their help and spend some lighthearted days together in the open air, enjoying the breathtaking view over the Tuscan hills. Everyone takes part in the process and being able to follow the product from the olive grove to the fork, is really exciting for all. 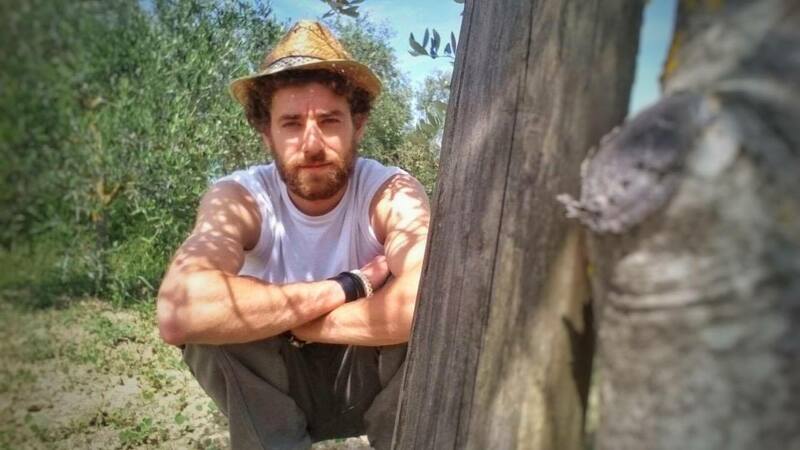 The day starts very early in the morning, when armed with rubber boots, comfy clothes and tools of the trade, we reach our small olive grove and start collecting the greenish-purple little gems. What we love the most about it, is that our family still preserves the tradition from generations, and a day of hard work in the farm, easily turns into a celebration. We love to recreate the old fashioned charm of living in the countryside, just like our grandparents used to: understanding the importance of this moment, giving thanks for nature’s richness and sharing the sweat, the laughter, the food and the wine, until the work is done! My grandfathers used to tell me about their harvest gatherings, describing those moments as the most important in the life of a farmer, for socializing and opening up with others on everyday life, by sharing the labor and the table. Our busy day harvesting olives comes to an end only after sunset, always following nature’s course. 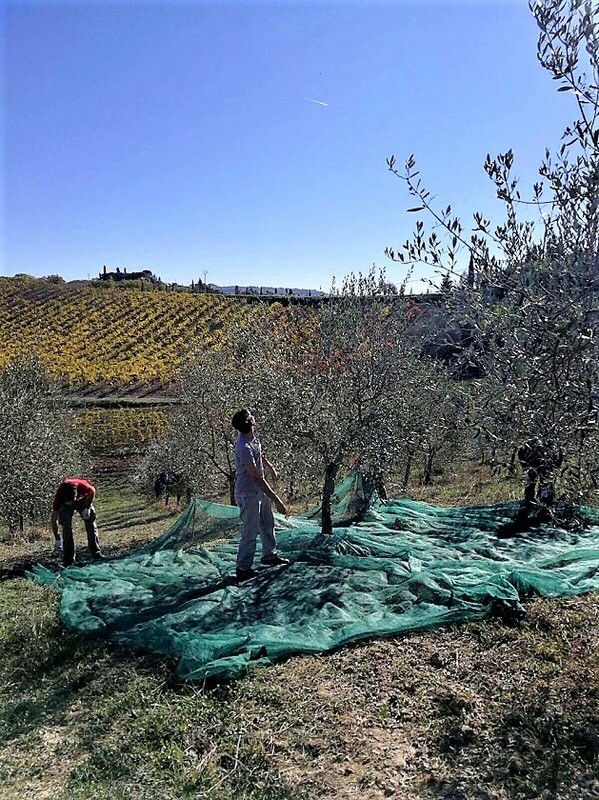 Depending on the size of the olive grove, it may take from one day to an entire week to finish, so we store the harvested pods in plastic boxes, or on the floor of a cool and well ventilated room, until we can take them to the mill for the pressing, but usually no longer than 48 hours. The mills in this area are quite a few and larger farms even have their own. We take our harvest to a very old mill nearby, that uses the traditional “cold pressing” process, to obtain the best expression of the extravirgin olive oil. 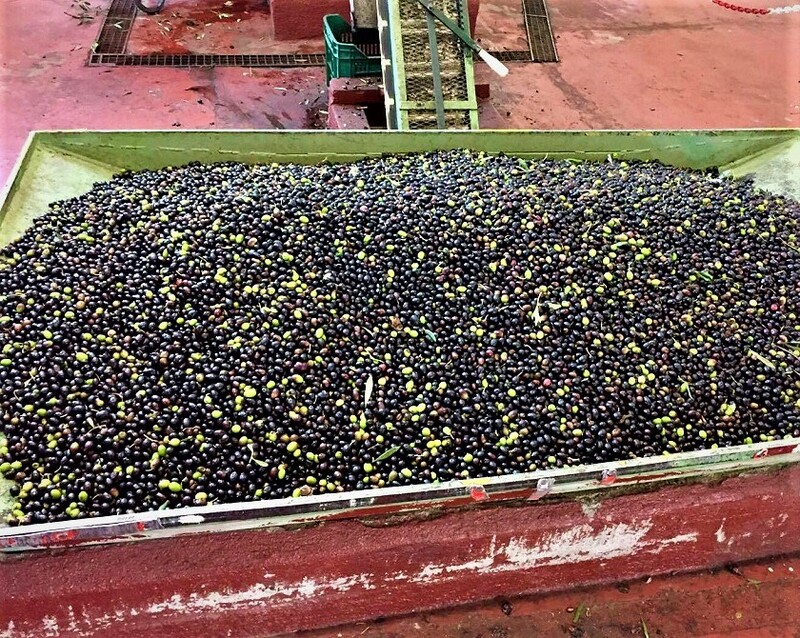 First, olives are washed in cold water, removing as much leaves as possible. All that’s left is being then crushed together by a giant milestone and stored in stainless steel tins. Now this is what we actually call “l’olio novo” (the new oil) here in Tuscany! It’s the freshly squeezed, unstrained and unprocessed extravirgin olive oil, that we all go crazy about. It’s the base ingredient for all our traditional cuisine dishes, and worldwide recommended for its well-known promoting nutrients and overall health benefits. We use it in our kitchens everyday: fresh drizzled over a salad, cooked in most dishes, sometimes as a healthy substitute for butter in cakes and even in the pan, for a healthier frying. 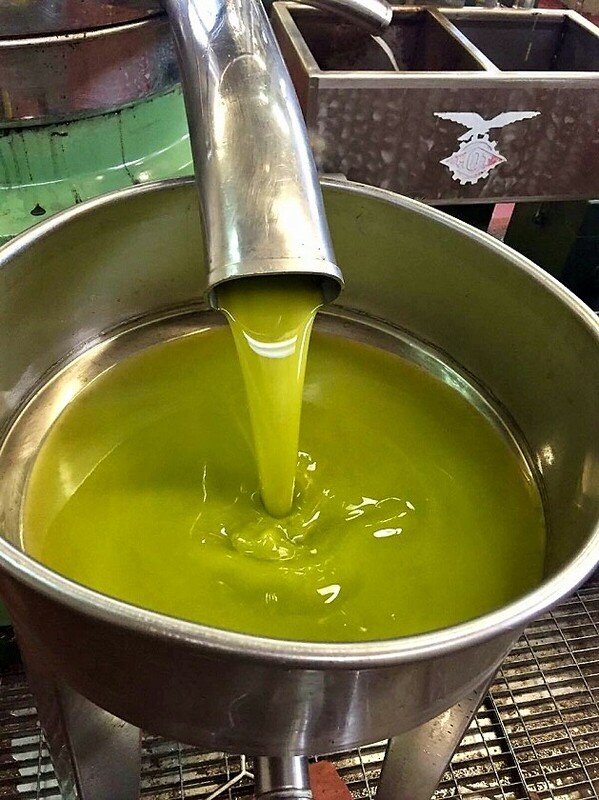 But when it comes to the fruity, peppery pungent freshly squeezed olive oil, the first thing that comes to mind is “la fettunta” (the greasy slice): the Tuscan traditional, healthiest and most simple dish ever, and the best way to enjoy to the fullest, the amazing flavor of “the new oil”. As soon as we bring the “green gold” back home, we just can’t help but drizzle it on a piece of Tuscan toasted white bread (unsalted); just like that, nothing else added, no other confounding ingredients, just our own special extravirgin olive oil… and this is when we realize that once again, all the sweat and the hard working was all worth it! 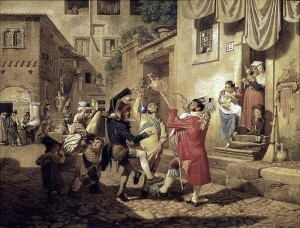 “Semel in anno licet insanire” (once a year, it is allowed to act like crazy) – our ancestors used to say on February, during the most bizarre and outgoing celebration of the year. The Carnival season is a tradition that we are carrying on since medieval times, when jesters used to run through the village, encouraging people – who were then oppressed by the system and used to live in extreme poverty – to parody the values of the society they lived in, and the authority of the severe political and religious commandments, by inverting the roles and creating the Backwards World, where they could disobey the rules and become whatever they wanted for a day, wearing the “clothes” of the character they were joking on, living in redundancy and acting like fools in the cheapest and most rumorous possible way. This rebellion would help them prepare for the forthcoming Lent season – the austere 40 days of Lent during which they had to abstain from eating meat and follow other ascetic practices, in order to purify their bodies and souls before the Easter festivity. In fact, the word Carnival seems to have Latin origins, as “carne levare” or “carnelevarium” means “giving up on meat”, a practice apparently dated back to the Romans era. In order to be able to carry on such a commitment of great sacrifice, the Middle Age people would celebrate the Carnival not only by joking and feasting around, but mostly by overindulging on substantial and greasy meals, pints of wine and the sweetest desserts. In Tuscany we are very bound to our ancient traditions, and fortunately some of them are still an important part of our cultural heritage. When the Carnival festivity comes up, local bakeries fill up their counters with greedy sweet and fried holiday treats, together with the traditional Tuscan dessert, which to this day has kept its original Renaissance recipe. 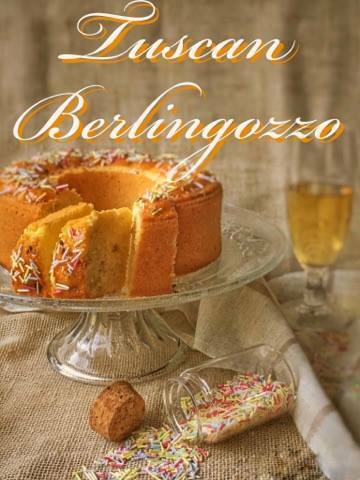 We are talking about the Berlingozzo (berlinˈgɔttso), a soft, moist and flavored donut cake, with one of the quickest and simplest recipes ever, just like our grandmothers used to do it! This carnival dessert disguised as a breakfast donut, used to be served on Fat Thursday, which in Florence was the day known as Berligaccio. 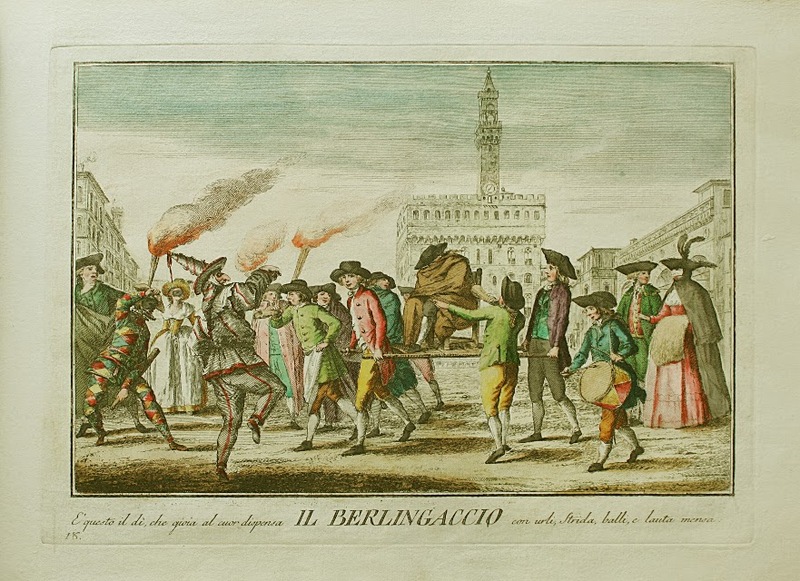 This funny word, was the name of a fifteen-century Tuscan mask, used in Florence during Fat Thursday, and represented by a mascot carried out in effigy through the city’s streets, among the loudest shouts, most colored dances and funny acting. 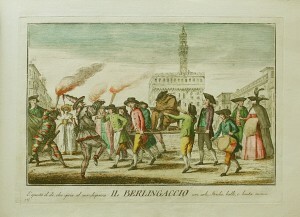 Just like “Carnevale”, it seems to have a Latin origin as well, from the word “berlengo” which means “table”; this takes us back to the feasting and overindulging tradition of the Medieval period. We also have a verb descended from it, that you can easily find in most of Boccaccio’s tales, as a proof of the ancient origins of this Tuscan custom. It’s “berlingare” and it means to chatter, or to blather about things with no sense, right after having had a substantial meal and several pints of wine. Giovanni Boccaccio, Certaldo’s local and most famous Late Medieval novelist, poet and humanist, used to make great use of this verb in his works, mostly when talking about or describing a female character, as he would associate it to women’s being so gossipy about everything. 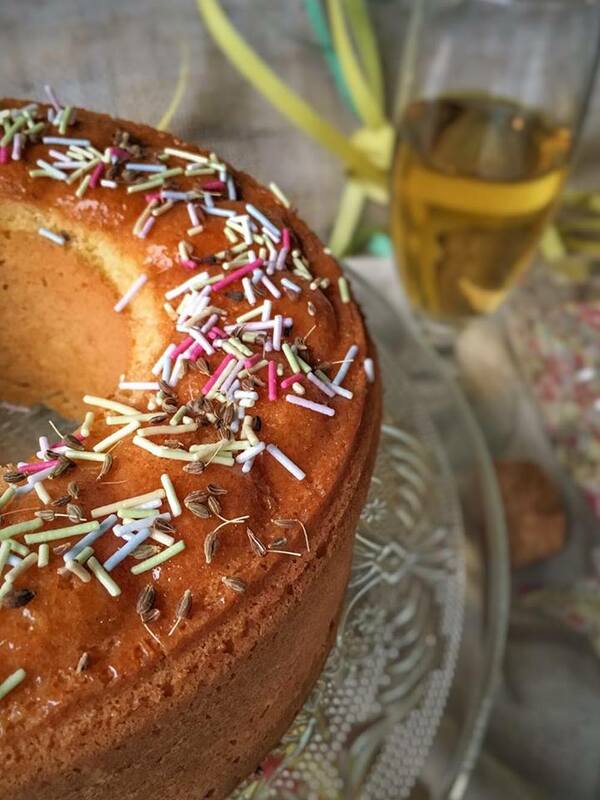 This year’s Fat Thursday is approaching, and after telling you all about this special time of the year here in Tuscany, we couldn’t just leave you there craving for a taste of some Tuscan Carnival treats. 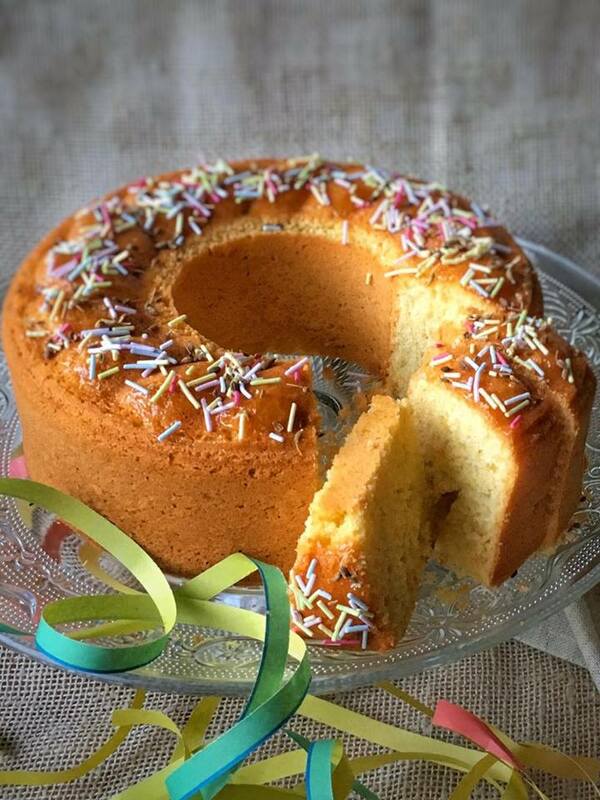 As we’re preparing for our traditional feast – next 23th of February – here in Certaldo, we want to share with you the joy of preparing and having a byte of this typical Tuscan dessert. So let’s not “chatter” any further and come to our nice and cheerful donut. It’s all about a couple of fresh egg yolks, beaten with some sugar until pale, mixed with lemon zest and a tablespoon or two of freshly squeezed lemon juice, some extravirgin olive oil and a nice cup of Vin Santo – now this is the secret right here! 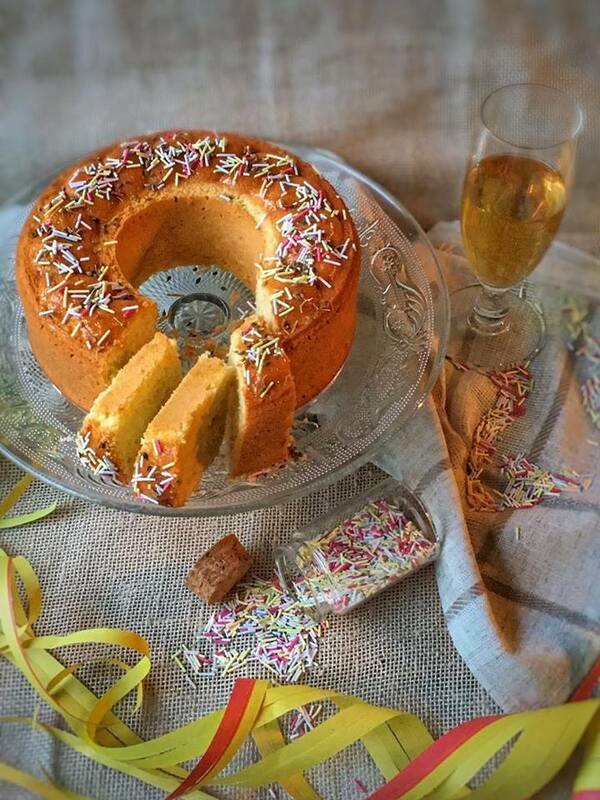 We like our Carnival desserts to be sweet and flavored, but our ancestors didn’t have any artificial flavors at the time; they simply used the home-made products they had, and that’s just what makes it so special. So following the ancient customs, we add in our Tuscan traditional home-made directly-from-our-vineyard Vin Santo: a type of italian dessert wine, usually made from white grape varieties such as Trebbiano and Malvasia, hanged and left to dry out on racks, in a warm and well ventilated area. If you ever come to Certaldo or anywhere near in Tuscany, you can have a taste of this marvelous sweet wine, together with the Cantuccini – our traditional home-made almond cookies, served as a dessert, at the end of your meal. It’s one of our most important landmarks around here, don’t miss it! At this point, we just pour in the flour, mixed to some potato starch and a pinch of salt, together with a bit of baking powder. 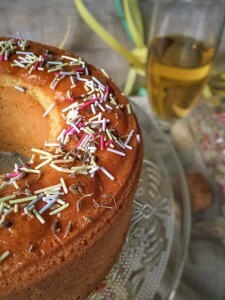 Then gently incorporate the beaten egg whites and pour the dough into a donut shaped baking tin, and into the oven, to bake for about a half an hour… Just enough time for us to sit and sip a nice glass of Vin Santo, while preparing our mask and costumes for the feast. Cheers! Every January is a new beginning here at Giuseppina’s Cooking School; as the nature awakens, we are preparing for a whole new year, load of great new recipes, delicious home-made preserves and fine tasty Chianti wine directly from our vineyards. There’s a great buzz in the air around here, and as Giuseppina is preparing to welcome and delight her guests this season, with new kitchen tricks and tips about her Tuscan recipes, we’re about to kick off with preparing our vineyards for a new great harvest year of fresh, marvelous wine that will go beautifully with our local cuisine dishes. 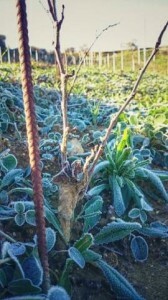 (Keep me poor -of unwanted trims- and I will make you rich -of the best grapes-). The vine is abundance, is love for the land in the shape of a grape and it takes a great passion and perseverance to produce the best wine possible, by making the most of the amazing properties that the land of Chianti has to give. The wine-harvest and tasting is just the final act of a year-long process of hard work and caring, that we are going to share with our guests, making them go beyond the scenes, further than the popular tourist attractions, the simple wine tasting or just a local visit to the vineyards. We stay out in front and give them the real deal about growing the Chianti vines, together with making them a real part of the story. Truffles – When, What, How?